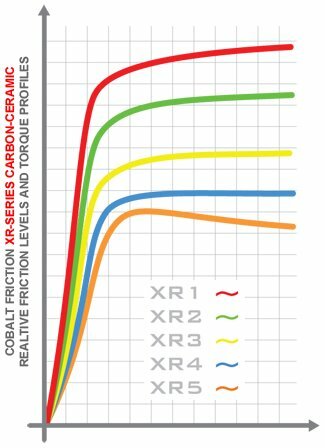 Cobalt XR2 is a high torque material featuring an initial bite that is 8-10% lower than XR1, but with the same controlled transition to a linear, rising torque curve. Improved modulation, threshold control and release characteristics make the XR2 particularly well-suited for chassis and tire combinations which do not respond well to excessive initial brake energy, but still require a high average torque level. Similarly, vehicles normally equipped with XR1 can move directly to the XR2 when low-grip conditions present themselves unexpectedly (e.g. qualifying in the dry, but rain/wet conditions on race day) without sacrificing or experiencing a change in pedal feel, consistency, or brake capacity. All Cobalt Friction brake pads are made to order, please allow 4-5 business days for your order to ship.